The present lot was designed by Charles Rennie Mackintosh in 1904 for the drawing room of Hous’Hill, the residence of Catherine Cranston, for whom he also designed the Willow Tea Rooms in Glasgow the previousyear. Within the drawing room sat a curvilinear screen which united the space’s component areas rather than separated them. Here, Mackintosh demonstrated his ingenuity as both designer and artist by sculpting furnishings expressly for the existing proportions of the rooms, so that they were both usable and beautiful objects: “One must evaluate Mackintosh’s furniture both as sculpture and as functional items for everyday use” (Roger Billcliffe, Mackintosh Furniture, Moffat, 1984, p.144). The resulting harmonious balance echoes Schopenhauer’s praise of music when he wrote: “the effect of music is so very much more powerful and penetrating than is that of the other arts” (The World as Will and Representation, vol.I, ch.II, 1918). Centered in the screen is the same semibreve that is reproduced in the center of the chair backs, and the linearity of the screen is further paralleled in the stretchers, a compositional concept that suggests that ”One should also acknowledge that his approach to spatial composition in these later works is primarily sculptural” (Billcliffe, 1984, ibid.). armchair is now in the Sydney and Frances Lewis Collection, at the Museum of Richmond, Virginia, and a low-back chair is in the Hunterian Museum, Glasgow. Both of these were sold by Sotheby’s in London in 1975 and 1995 respectively, while the remaining known low-back chair belongs to a private collection. 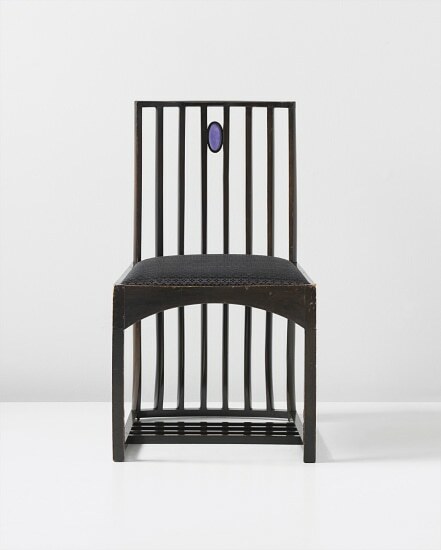 Examples of the Hous’Hill chair, have been exhibited in the following locations: The Fine Art Society, London, Spring 1996; ‘Charles Rennie Mackintosh’, Glasgow Museums traveling exhibition, May 25, 1996–October 12, 1997; ‘Mackintosh and the Glasgow Style’, Mie Prefectural Art Museum, Tsu-shi, Japan, December 12, 2000–February 18, 2001. Stained sycamore, lavender glass medallion, fabric. Frame produced by Alex Martin and glass by McCulloch and Company, Scotland. From the production of four side chairs and one high-backed chair. The inside of frame and underside of seat both impressed with ‘X’.